This is a moist, dark cake. If you choose to add the spices, the flavor will take on an air of mystery. 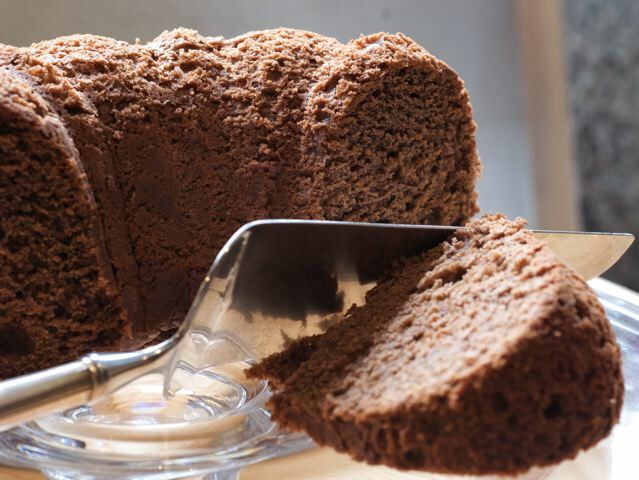 It is almost a spice cake, understatedly chocolate, with a touch of orange, and all the luxurious qualities of an applesauce-nut cake. This recipe is minimally sweet, so if you prefer a sweeter dessert, you can increase the sugar to 2 cups or use sweetened applesauce. Preheat the oven to 350 degrees. Butter a standard-sized tube pan. In a large bowl, cream the butter and sugar. Add the eggs, one at a time, beating well after each. Stir in the vanilla and orange rind. Set aside. In a separate bowl, sift together all the dry ingredients (including the optional spices or not). Stir them into the ground walnuts. In a third bowl, whisk together the applesauce and yogurt or sour cream until well blended. Add the dry mixture and the applesauce mixture alternately to the butter mixture (dry-wet-dry-wet). Stir just enough to blend after each addition. Turn the batter into the prepared tube pan. Bake 45 to 55 minutes at 350 degrees. The cake is done when a sharp knife inserted into the center comes out clean.